Hear that hum as a bumblebee settles onto a tomato blossom? It’s a faint but powerful sound: The bee is working hard. It’s grabbing the flower with its jaws, vibrating its flight muscles and producing a tone that’s close to middle C. That vibration causes the flower to release pollen – a process called sonication, or buzz pollination. 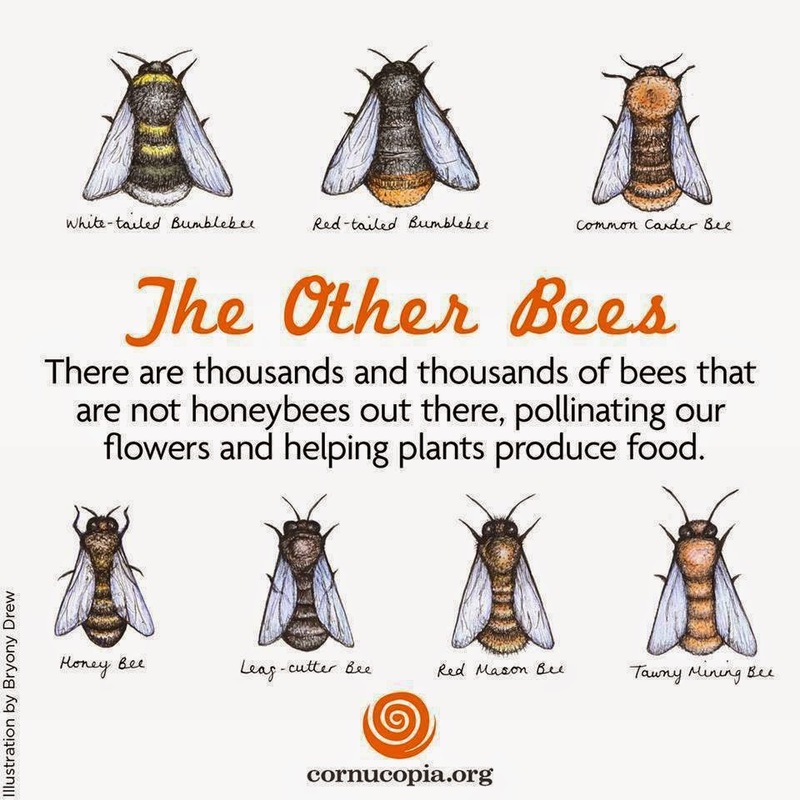 But what most farmers don’t realize – and the rest of us, too, as we anxiously search our gardens and parks for honeybees – is that there are another 20,000 species of bees. Four thousand are native to North America – including 50 native bumblebees – and they are busily at work in our landscapes. 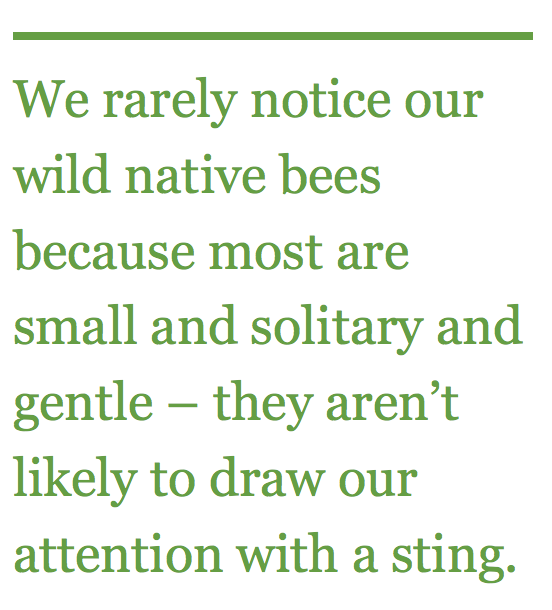 We rarely notice our wild native bees because most are small and solitary and gentle – they aren’t likely to draw our attention with a sting. But their impact on flowering plants is huge, with studies suggesting that they’re twice as effective at pollination than honeybees. For one thing, Maden says, not all honeybees are even interested in pollen. Some are pollen foragers, but most are nectar foragers that ignore the critical spot where the flowers display pollen, called anthers. For another, honeybees are exceptionally finicky about the weather. They won’t fly when it’s cool, cloudy or rainy, whereas our native wild bees are game for inclement days. And honeybees sleep late. Valuable as our native wild bees are, their populations are dropping – for instance, an analysis by the Xerces Society ‘s Rich Hatfield suggests that 30% of our native bumblebees are threatened by extinction. But Maden says that this is one threatened species story that can easily have a happy ending: Just plant wildflowers. The loss of native flowering plants from development and conventional agriculture – especially the vast stretches of Roundup-resistant GMO crops in which everything but that commercial plant has been blasted away – has eliminated habitat for wild bees. Quite simply, there isn’t enough food for wild bees when there is only one plant – the commercial plant – blooming for a few weeks. They need a flowery source of food spring, summer and fall. 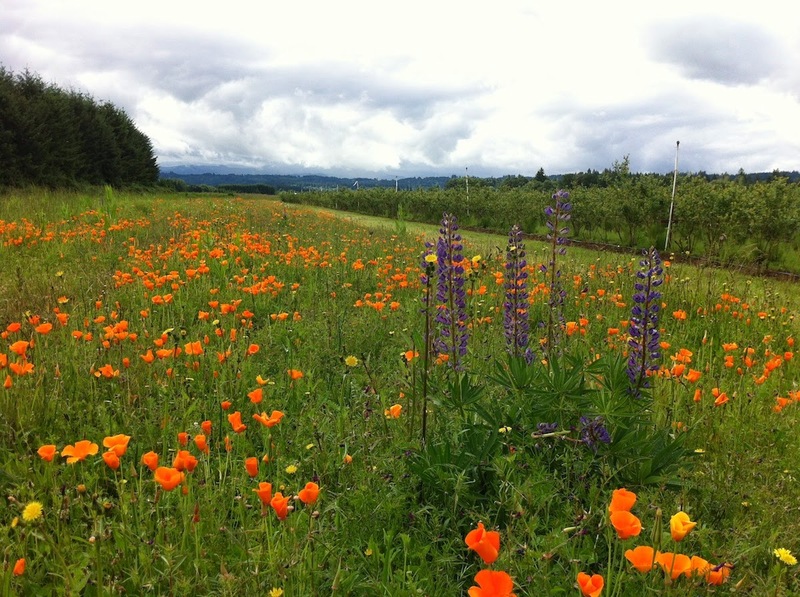 Farmers who create habitat for wild bees are doing themselves a favor. Maden points to a study by biologists Lora Morandin and Mark Winston showing that canola growers who took 30 percent of their land out of production and let native plants flourish grew as much or more seed on their remaining land. * A soon-to-be published study by Michigan State University entomologist Rufus Isaacs and former student Brett Blaauw shows that blueberry farmers who put in wildflower borders had more wild bees per bush and up to 800 pounds more fruit per acre adjacent to the plantings. Planting wildflowers not only helps our wild bees thrive. It also saves butterflies. They aren’t essential pollinators, but they provide food for birds and have a place in the ecosystem – and they’re so darned pretty. Butterfly scientists are alarmed at the rate of disappearance of several common species including the Monarch, whose numbers may be so low that they will be unable to manage a migration this year. Their favored plant, the milkweed, has been decimated by the use of Roundup in cornfields planted with GMO glyphosate-resistant corn. You get the point. He doesn’t want you to kill bees and butterflies with your car, but it would be great if there were once again so many of them that they’re hard to miss. Find some wildflower seeds native to your region, and go sow.